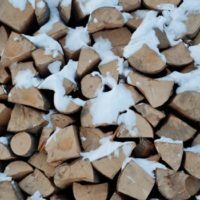 Do You Burn Wood or Coal to Keep Warm in Winter? This entry was posted on March 29, 2018 by Logs Direct. With the nights as cold as they are, it’s a common question to hear discussed. To get the best results from your fire in the winter months, do you burn wood or coal? Do you prefer burning seasoned or kiln-dried wood? The great thing about using logs in your fire is that you can vary the woods you use. Softwoods burn faster and hotter, while hardwoods give out as much heat but burn for a lot longer. Mixing the two allows you to get the right balance between temperature and need to continue feeding the fire. It’s a delicate skill, but well worth developing. Burning logs also means you can get the beautiful aromas of woodsmoke. That creates a wonderful atmosphere. It can really add to the cosy, comforting feel of your fire. Coal fires tend to be more even, with a steady heat profile. Fires will need to be replenished from time to time, but can burn late into the night, meaning that often your hearth will still be quite warm as you rise. Here at Logs Direct, we feel that the biggest advantage coal fires have is one that doesn’t come up much. That steady heat profile is great for mulling wine over the fire. Not only is that a wonderful winter tradition, but it means it’s the living room filled with delicious smells. You don’t have to leave it behind in the kitchen! Some call these the best of both worlds, with the stability of a coal fire and the enjoyable scent of woodsmoke. Perhaps the biggest complaint we hear about mixed fires is keeping logs and coal both on hand. What’s your perfect winter fire, and why? Get in touch with us and we’ll help you make sure your stocks stay high.